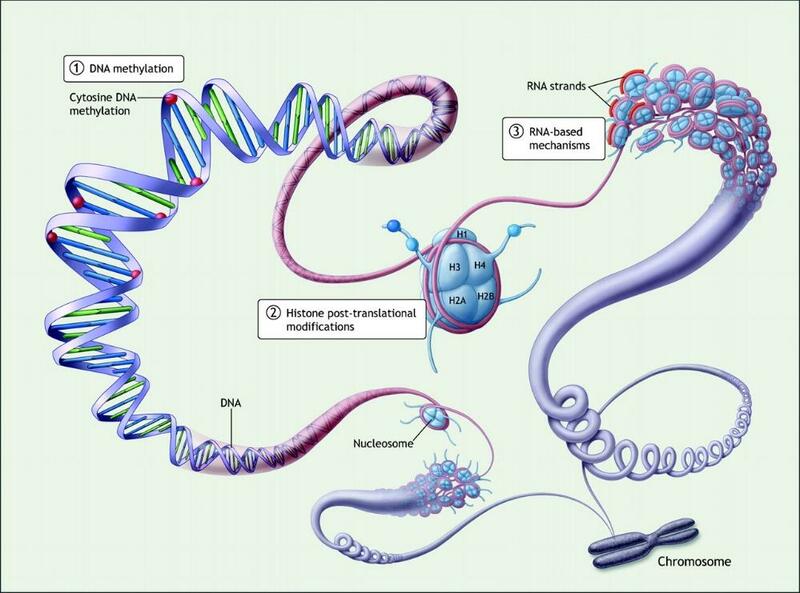 Epigenetics refers to changes in chromatin structure that play an important role in the regulation of gene expression. Among epigenetic mechanisms, histone modifications and DNA methylation affect chromatin compaction and thus activation/repression of genes during cell division and differentiation. The role of chromatin changes during interphase is widely studied, however, little is known about the role of the epigenetic state on mitotic chromosome structures. This review summarizes the current knowledge about the role of epigenetics during the cell cycle and cell differentiation. Furthermore, describe here a method allowing to sort, label, and image, via high resolution microscopy, the structure of mitotic chromosomes. Key words: Epigenetics, mitotic chromosomes, chromosome sorting, high resolution imaging. During the last few decades, epigenetics has increasingly emerged as a major phenomenon in life science. The term epigenetics, literally meaning “above” genetics, was first introduced by the British biologist Conrad H. Waddington in the early 1940s in a paper entitled “The Epigenotype”. This was even before the discovery of DNA. Since then, the definition of epigenetics has evolved and refers today to heritable changes in chromatin structure that play an important role in the regulation of gene expression without changing the DNA sequence. [1, 2] Nucleosomes represent the basic units of the chromatin. They consist of DNA (146 base pair) wrapped around the histone octamer complex made of histone proteins H2A, H2B, H3 and H4. Chromatin remodelling involves several mechanisms, which will be explored in the following sections, including DNA methylation, covalent histone modifications, and non-coding RNA, and it contributes to the formation and the maintenance of active and repressive chromatin conformations. Epigenetic mechanisms are essential for normal development of cells and thus the organism itself, and have been shown to play a crucial role in a wide variety of biological processes including cell division, cell differentiation, genome integrity – which maintains the genetic elements of the cell’s genome from the intra- and extracellular environment whilst allowing for mutations to allow evolution to take place – as well as in different pathologies such as cancers. Figure 2: Schematic representation of DNA methylation (classical model). Histone tails can undergo different post-translational modifications such as methylation (addition of a methyl group), acetylation (addition of an acetyl group), and phosphorylation (addition of a phosphate group). These modifications are catalysed by different enzymes such as histone methyltransferases and histone acetyltransferases. Some histone modifications such as histone H3 acetylation or lysine 4 trimethylation, where three methyl groups are added, act as ‘activating’ and are thus associated with chromatin decondensation and activation of gene expression (referred to as euchromatin). While other modifications, such as trimethylation of lysine 9 of histone H3 (H3K9me3) and trimethylation of lysine 27 of histone H3 (H3K27me3) are ‘repressive’ modifications, associated with chromatin condensation and gene repression (referred to as heterochromatin). Trimethylation of H3K27 is mediated by the Polycomb group protein PRC2. This complex consists of three major subunits (SUZ12, EED, and EZH1/2) and has been shown to play a critical role in regulating developmental genes during cell differentiation. Another repressive mark, H3K9me3, also plays an important role in the regulation of gene expression, genomic stability (the maintenance of genomes with low frequencies of acquiring aberrational mutations and transmissions down cellular lineages) and nuclear organisation (the distribution in space of chromatin within the nuclei of cells). Trimethylation of H3K9 is catalysed by SUV39H1/2 and SETDB1 enzymes and is mainly implicated in the formation of constitutive heterochromatin (regions of the genome permanently silent, such as centromeric and telomeric repeats). Figure 3: Histone modifications and the formation of active and repressive chromatin conformations. Non-coding RNA (ncRNA) are functional RNA molecules which are transcribed from DNA but they are not then translated into proteins. They are called functional in the sense that whilst they may not be translated to proteins instead, many ncRNA are involved in the regulation of gene expression and thus interact with other RNAs such as mRNA and tRNA. There are a variety of ncRNA, which can be categorised into two composite groups of short ncRNA (< 30 nts [nucleotides]) and long ncRNA (> 200 nts). Both forms of ncRNA have been shown to play roles in gene expression and epigenetic mechanisms. The group of short ncRNAs can be further subdivided into three major classes of microRNAs (miRNAs), short interfering RNAs (siRNAs) and piwi-interacting RNAs (piRNAs). miRNAs conduct their roles in gene expression through a mechanism of binding to target mRNAs via complementary base pairing such that the mRNA can not then be translated and if complete binding occurs, such can lead to the target mRNA undergoing degradation. The expression of miRNAs is not fully understood, however, research has shown that epigenetic mechanisms such as DNA methylation and histone modifications of genes, in which miRNAs are located within the introns, regulates the expression of miRNAs themselves. Furthermore, other groups of miRNA control the expression of epigenetic modifiers such as DNA methyltransferases and histone deacetylases. siRNAs are considered to be closely related to miRNAs and thereby function in a similar manner. siRNAs, as mentioned, can regulate post-transcriptional gene silencing via causing the degradation of target mRNAs to which they bind. siRNAs have also been implicated in mechanisms of RNA-directed DNA methylation (RdDM) in plants whereby siRNA combine with protein complexes and the binding of the siRNA leads to the targeting of the complex to RdDM loci and subsequent methylation post-recruitment of DNA methyltransferases for de novo DNA methylation. The other class of short ncRNA is that of piRNAs (piwi-interacting RNAs) which interact with the piwi family of proteins. The mechanism of function of piRNAs involves target transposons, which are sequences of DNA which can change its position within the genome thereby altering gene activity depending upon the position of entry (e.g. if it enters within exons, introns or promoter regions and causes overexpression of the gene). Present in complexes with PIWI-proteins (piRISCs: piRNA-induced silencing complexes), piRNA bind, via complementary base pairing, to transposon RNA targets and induce the cleavage of the targets, thereby preventing the translation of transposase enzymes that would otherwise have catalysed the transposition of DNA transposons. [13, 16] This thus regulates transposon activity and thus maintains genomic stability. The cleavage then generates secondary piRNA molecules with base sequences complementary to the (primary) piRNA that initially caused cleavage thereby highlighting the cyclic nature of piRNA function. The role of piRNA in epigenetics arises from findings in male mice germlines (cellular lineage of gametes) where piRNA complexes with MIWI2 protein (of the PIWI family of proteins) during embryonic germ cell development. The complex is then imported into the nucleus (the post-transcriptional gene silencing mechanism of piRNA occurs in the cytoplasm with the other piRISCs) and the piRNA binds, via complementary base pairing, to DNA transposons and directs DNA methylation via RdDM, thereby forming heterochromatin and reducing the expression of that target transposon. This thus prevents transposon activation which would have otherwise led to meiotic failure and sterility in mice . For the long ncRNAs (lncRNAs), they are thought to function in a similar to transcription factors, whereby lncRNAs interact with with chromatin-modifying complexes at target sites to induce gene activation or gene repression depending upon the specific enzymes recruited by said complexes. Epigenetic mechanisms play an important role in the cell cycle by regulating genomic processes including DNA replication, repair, and transcription by controlling DNA accessibility, for molecules involved in said processes, and compaction. Mitosis is the phase of the cell cycle where replicated chromosomes are divided into two identical nuclei. 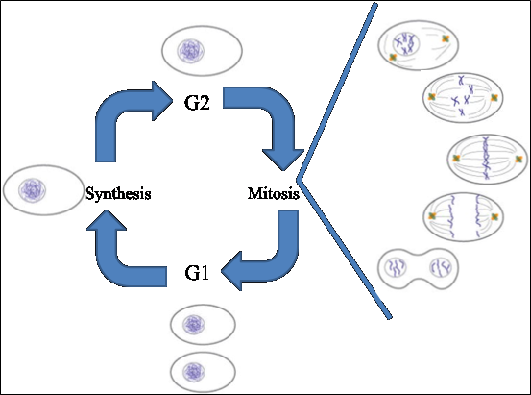 A pre-requirement of mitosis is duplication of the genetic material during the S stage of interphase. One fundamental question in cell biology is how one cell divides into two identical cells and how the chromatin state is maintained through cell division during the cell cycle. Chromatin characteristics in interphase are widely studied and are important for the regulation of eu- and heterochromatic chromosomal territories and gene expression. During mitosis, chromatin undergoes dramatic changes and chromosomes become highly condensed thanks to protein complexes called condensins. In the classical model, the primary DNA-nucleosome progressively folds into higher-order chromatin fibers, initially into 11-nm-fibers, then into 30nm fibers and, ultimately into mitotic chromosomes. However, the validity of this model is coming under scrutiny as many recent studies are increasingly questioning the existence of these chromosome fibers. To date, the exact characteristics of mitotic chromatin and the role of histone modifications and DNA methylation on mitotic chromosome structure are still poorly understood. Figure 4: Overview of cell morphological and chromatin changes during the different phases of the cell cycle. In order to study the role of epigenetic changes on mitotic chromosome structure, mitotic chromosomes can be isolated using flow cytometry (see Appendix) and then imaged using confocal microscopy, a form of high-resolution microscopy. To facilitate imaging intact chromosome structure and to measure the compaction level of chromosomes, labelling DNA binding protein such as telomeres, centromere or even histones modifications can be achieved by immunofluorescence (a common technique used where protein-specific antibodies conjugated to dyes are used for said proteins) or by live labelling using fusion protein expressing plasmids (which involves labelling a protein of interest, such as those mentioned, with a fluorescent protein in order to visualise them). 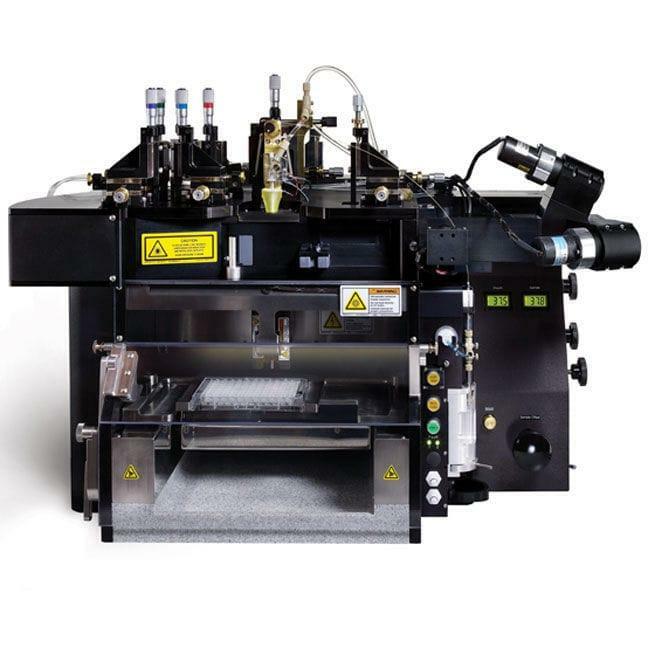 Fluorescence-activated cell sorting (FACS) is a specialised form of flow cytometry whereby objects of interest, i.e. the chromosomes, are stained using stains such as Hoechst 33258 and Chromomycin A3 due to their actions in binding to AT and CG rich regions of DNA, respectively. [23, 24] Using the example stains, Hoechst 33258 absorbs at a wavelength of ~ 360 nm and emits a blue fluorescence at a wavelength of ~ 460 nm and Chromomycin absorbs UV light at a wavelength of 430 nm, emitting fluorescent light at a wavelength of ~ 570 nm. [23, 24] Due to the relative differences in AT and CG content as relevant to the example here, the chromosomes are sorted into separate containers based upon their relative and known emission wavelengths determined by the flow cytometer. Once isolated, the chromosomes can then be labelled for imaging. For more information about sorting chromosomes using flow cytometry, please see the Appendix. When studying epigenetic changes on mitotic chromosome structure or for other purposes, it is often, if not always, necessary to view them through the microscope to observe and record the impacts. A key question to ask is how can it be ensured that the preparation of the chromosomes for chromosome sorting or for confocal microscopy did not damage their integrity? Thus, to provide evidence that the integrity of the chromosomes was maintained during the preparation stages and the data collected was unaffected through that avenue, it is necessary to be able to label chromosomes using binding proteins. Chromosome structure during mitosis has been studied extensively and it is accepted that two chromatids are attached at the centromere. Thus, if mitotic chromosomes were indeed intact post-preparations then it would be normal to assume that the centromere would still be present. To illustrate this, consider staining chromosomes, via immunofluorescence, with chromosome binding proteins such as CENPA. Using a primary antibody which recognises and binds to the CENPA protein, the sample of isolated chromosomes can be treated with said antibodies. Post-treatment, a secondary antibody fused with a fluorescent molecule, for example Alexa-488, is used as it recognises and binds to the primary antibody. When imaged using a confocal microscope, the centromere is thus marked by fluorescent dots, thereby indicating that chromosome integrity had been preserved after chromosome sorting. However, utilising further knowledge of chromosome structure, such a method can be criticised as to the evidence it provides. Whilst it can show that the two sister chromatids are indeed bound together, it does not illustrate that the overall chromosome’s structure has not been affected – after all, the ends of the chromosomes are not labelled and it is possible that they have been cut during the preparations. It is known that there are telomeric proteins, such as Trf1, which bind to the sequential repeats of all telomeres. Thus, if such a protein, bound to a fluorescent molecule, was used to label the telomeres of the isolated chromosomes, then the presence of all four telomeres when the chromosomes are imaged would provide evidence that chromosome integrity was not compromised during preparations. Moreover, such a strategy of telomere staining would be compatible with live cell imaging of the native chromosome, avoiding the need for procedures such as fixing which has been suspected to modify chromosome structure. It would also allow for further calculations, such as determining comparative chromosome sizes, for example, by measuring the length from one telomere to another. Finally, this native staining would be compatible with cryo-EM for higher resolution microscopy when studying the chromosome structure. This review aims to summarise the current knowledge about the role of epigenetics during the cell cycle and cell differentiation. Furthermore, it aims to describe a method allowing to sort, label, and image, via high resolution microscopy, the structure of mitotic chromosomes. Current technological advancements have allowed for adaptations in sorting and isolating chromosomes to study impacts on their structure. Furthermore, novel techniques in labelling DNA-binding proteins in live cells are well underway. Whilst the role of epigenetic changes on mitotic chromosome structure is an area where little is known, further studies can be expected to be undertaken to understand the impact of chromatin state and epigenetic modifiers mitotic chromosomal structure. The resources available to us present the opportunity to make future progress in observing and understanding genetic and epigenetic changes. These could then be utilised in a variety of ways such as addressing issues of ageing, X-linked diseases and gene therapies. Firstly, I would like to thank Professor Matthias Merkenschlager for hosting me at his lab and providing the invaluable insight into the field of scientific research during my summer research placement. Secondly, I would like to express my sincerest gratitude to Dr Dounia Djeghloul and Dr Amelie Feytout. They are, in my opinion, the best supervisors one could wish for. As well as that, they are caring mentors and patient teachers who will clarify all questions, regardless of how many asked! It has been my honour to have worked with and been taught by them. I would also like to thank the other inspiring scientists of the Lymphocyte Development Group with whom I had the pleasure of spending my time there: Andrew, Ceris, Chiara, Felix, Irene, Kotryna, Ludovica, Maria, Naomi, and Sergi. Their stimulating conversations and invaluable advice was much appreciated and their approach to science and research is one I hope to emulate in the years to come. FACS utilises light to count and profile a large population of loose cells (and other objects, such as chromosomes) in a heterogeneous fluid mixture (a mixture where the composition of components is non-uniform and components can be separated by mechanical means, e.g. centrifugation). Due to the ability to use a variety of mechanical adjustments it is possible to collect many different data related to each object and to the overall mixture. Sorting occurs via charging individual droplets with a particular charge using an electrode (i.e. positive and negative). When a droplet contains the desired aspect (e.g. chromosome 19) then it is given a unique charge whilst others are given an opposite charge, then electromagnets sort the droplets (containing chromosomes) into respective containers. Various types of light are used in the flow cytometer. Forward scatter light (FSL) is one example, it is where light is diffracted by a cell in the capillary tube and continues in the original light path. The FSLis then detected by a sensor, and the ‘shadow’ produced can be used to identify the size of the object. Larger objects produce more FSL compared to smaller objects and so have a stronger forward scatter signal (and vice-versa for smaller objects). Side scatter light is another example where light passes from the illumination source into the flow channel and is refracted by cells in a direction outside the original path of the light. Sensors are present at right angles to the original path of light. Side scatter light is often used to determine the granularity and complexity of cells. Granularity refers to the opacity/transparency of the cells’ shadows (‘the darkness of the shadows’) and is linked to the cells’ complexity where highly granular cells have high internal complexities, and more side scattered light is produced. Burggren, Warren. “Epigenetic Inheritance and Its Role in Evolutionary Biology: Re-Evaluation and New Perspectives.” Biology 5, no. 2 (2016): 24. doi:10.3390/biology5020024. Tarakhovsky, Alexander. “Tools and Landscapes of Epigenetics.” Nature Immunology 11, no. 7 (2010): 565–68. doi:10.1038/ni0710-565. Cutter, Amber R., and Jeffrey J. Hayes. “A Brief Review of Nucleosome Structure.” FEBS Letters 589, no. 20PartA (2015): 2914–22. doi:10.1016/j.febslet.2015.05.016. Matouk CC & Marsden PA (2008) “Epigenetic regulation of vascular endothelial gene expression.” Circ Res 102(8):873-887. Song, Chun-Xiao, and Chuan He. “Potential Functional Roles of DNA Demethylation Intermediates.” Trends in Biochemical Sciences 38, no. 10 (2013): 480–84. doi:10.1016/j.tibs.2013.07.003. Wu, Hao, and Yi Zhang. “Reversing DNA Methylation: Mechanisms, Genomics, and Biological Functions.” Cell 156, no. 1-2 (2014): 45–68. doi:10.1016/j.cell.2013.12.019. Tsumura, Akiko, Tomohiro Hayakawa, Yuichi Kumaki, Shin-Ichiro Takebayashi, Morito Sakaue, Chisa Matsuoka, Kunitada Shimotohno, et al. “Maintenance of Self-Renewal Ability of Mouse Embryonic Stem Cells in the Absence of DNA Methyltransferases Dnmt1, Dnmt3a and Dnmt3b.” Genes to Cells 11, no. 7 (2006): 805–14. doi:10.1111/j.1365-2443.2006.00984.x. Maresca, Alessandra. “Dna Methyltransferase 1 Mutations and Mitochondrial Pathology: Is Mtdna Methylated?” Frontiers in Genetics 6 (2015). doi:10.3389/fgene.2015.00090. Bannister, Andrew J, and Tony Kouzarides. “Regulation Of Chromatin By Histone Modifications”. Cell Research 21, no. 3 (2011): 381-395. doi:10.1038/cr.2011.22. Azuara, Véronique, Pascale Perry, Stephan Sauer, Mikhail Spivakov, Helle F. Jørgensen, Rosalind M. John, Mina Gouti, et al. “Chromatin Signatures of Pluripotent Cell Lines.” Nature Cell Biology 8, no. 5 (2006): 532–38. doi:10.1038/ncb1403. Peters, Antoine H.f.m., Dónal O’carroll, Harry Scherthan, Karl Mechtler, Stephan Sauer, Christian Schöfer, Klara Weipoltshammer, et al. “Loss of the Suv39h Histone Methyltransferases Impairs Mammalian Heterochromatin and Genome Stability.” Cell 107, no. 3 (2001): 323–37. doi:10.1016/s0092-8674(01)00542-6. Probst, Aline V., Elaine Dunleavy, and Geneviève Almouzni. “Epigenetic Inheritance during the Cell Cycle.” Nature Reviews Molecular Cell Biology 10, no. 3 (2009): 192–206. doi:10.1038/nrm2640. Collins, Lesley J., Barbara Schönfeld, and Xiaowei Sylvia Chen. “The Epigenetics of Non-Coding RNA.” Handbook of Epigenetics, 2011, 49–61. doi:10.1016/b978-0-12-375709-8.00004-6. Chuang, Jody C, and Peter A Jones. “Epigenetics and MicroRNAs.” Pediatric Research 61, no. 5 Part 2 (2007). doi:10.1203/pdr.0b013e3180457684. Xie, Meng, and Bin Yu. “SiRNA-Directed DNA Methylation in Plants.” Current Genomics 16, no. 1 (2015): 23–31. doi:10.2174/1389202915666141128002211. Munoz-Lopez, Martin, and Jose Garcia-Perez. “DNA Transposons: Nature and Applications in Genomics.” Current Genomics 11, no. 2 (January 2010): 115–28. doi:10.2174/138920210790886871. Carmell, Michelle A., Angélique Girard, Henk J.g. Van De Kant, Deborah Bourc’his, Timothy H. Bestor, Dirk G. De Rooij, and Gregory J. Hannon. “MIWI2 Is Essential for Spermatogenesis and Repression of Transposons in the Mouse Male Germline.” Developmental Cell 12, no. 4 (2007): 503–14. doi:10.1016/j.devcel.2007.03.001. Mercer, Tim R, and John S Mattick. “Structure and Function of Long Noncoding RNAs in Epigenetic Regulation.” Nature Structural &amp; Molecular Biology 20, no. 3 (2013): 300–307. doi:10.1038/nsmb.2480. Chen, Taiping, and Sharon Y. R. Dent. “Chromatin Modifiers and Remodellers: Regulators of Cellular Differentiation.” Nature Reviews Genetics 15, no. 2 (2013): 93–106. doi:10.1038/nrg3607. Gaspar-Maia, Alexandre, Adi Alajem, Eran Meshorer, and Miguel Ramalho-Santos. “Open Chromatin in Pluripotency and Reprogramming.” Nature Reviews Molecular Cell Biology 12, no. 1 (2011): 36–47. doi:10.1038/nrm3036. Oomen, Marlies E., and Job Dekker. “Epigenetic Characteristics of the Mitotic Chromosome in 1D and 3D.” Critical Reviews in Biochemistry and Molecular Biology 52, no. 2 (2017): 185–204. doi:10.1080/10409238.2017.1287160. Putiri, Emily L., and Keith D. Robertson. “Epigenetic Mechanisms And Genome Stability”. Clinical Epigenetics 2, no. 2 (2010): 299-314. doi:10.1007/s13148-010-0017-z. Brind’amour, Julie, and Peter M Lansdorp. “Analysis of Repetitive DNA in Chromosomes by Flow Cytometry.” Nature Methods 8, no. 6 (January 2011): 484–86. doi:10.1038/nmeth.1601. Azmaeen Zarif is an inquisitive individual with a unique aptitude for the sciences. 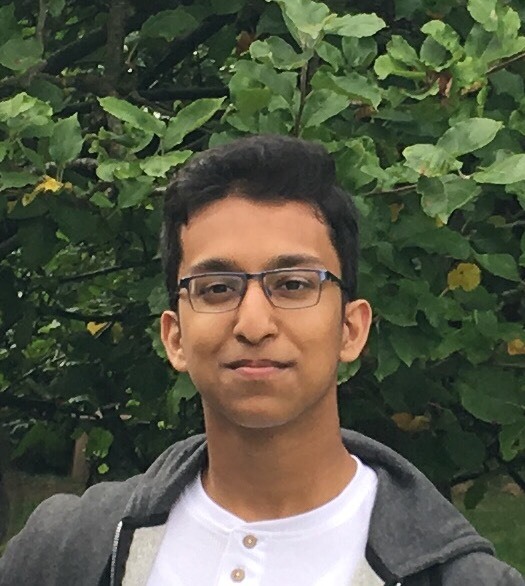 His academic achievements include 13 A*s for his GCSEs as well as Gold awards for UKMT Maths challenges and a Silver in the Cambridge Chemistry Challenge. His school and community contributions have been recognised in his Jack Petchey & Harvard Book Prize awards.In his spare time, he enjoys volunteering and sports.